Daniel Ricciardo is now set to secure the second Red Bull Formula 1 seat for 2014, with talks between the team and Kimi Raikkonen having come to an end. Amid growing speculation that Red Bull had decided to pick Ricciardo, Raikkonen’s manager Steve Robertson told AUTOSPORT on Monday that the Finn was no longer a contender to line-up alongside Sebastian Vettel next year. Robertson confirmed the news, which first appeared in Finnish newspaper Turun Sanomat, that the former world champion’s discussions with Red Bull had come to an end. Red Bull had openly admitted that its choice for Mark Webber’s replacement was between Raikkonen and Ricciardo – despite being made aware in Hungary that Fernando Alonso could be available too. Raikkonen had always been happy to stay at Lotus for 2014, but the prospect of racing for reigning champion Red Bull was given serious consideration. The Finn’s representatives opened negotiations with Red Bull, as the team weighed up whether to opt for Raikkonen’s experience and guaranteed speed, or put its faith in a youngster like Ricciardo as a long term prospect. Although Red Bull is insisting that it is not in a position yet to announce its 2014 drivers, Robertson’s revelation that Raikkonen is now out of the running points to a Ricciardo deal being a formality. An announcement about Red Bull’s plans could be made as soon as this weekend’s Belgian Grand Prix, although the team may opt to wait for the following race in Italy. Should Ricciardo be confirmed, he will move up to Red Bull’s main team after two full seasons with its junior Toro Rosso outfit. He also competed in 11 races for HRT in 2011. The collapse of the Red Bull talks means that Raikkonen’s best option to remain in competitive machinery in 2014 is to finalise a fresh deal with Lotus. But such a deal is not a formality, amid questions about the financial health of the team, with Raikkonen having been paid late on some occasions. Robertson said that Lotus was just one possibility for Raikkonen as talks continued with a number of teams. Domenicali hints at a Raikkonen deal with Italian journalist Leo Turrini – who is considered the unofficial voice of Ferrari, (and good friend of Domenicali and Di Montezemolo and a big Kimi fan) had lunch with Stefano Domenicali, which they often do. The link provides an extract from their lunch as told by Turrini. SuomiF1 report Raikkonen’s two-year Ferrari contract – Speculations around Kimi Räikkönen and Ferrari have been heated, ever since SuomiF1-website published on August 1st, as the first media in the world, the news that Kimi had already signed a contract with Ferrari. Lately the majority of experts have leaned in the direction that Kimi will really be seen in the red car in 2014. Now they speculate in the media about the lenght of the contract and when it will be announced. – The contract is for two years and it has an option for a third year. It’s still unclear if they tell about a 2- or 3-year long contract when they announce it. My guess is that Ferrari announces that the contract is for two years, although in reality it is 2+1, a source close to Ferrari told our website. In F1 an option in a contract can mean many things. Usually either the team binds the driver for an additional year depending on his success, or then a driver agrees to one more additional year if the team can prove their competitiveness during the contract season. The option can on the other hand also be decided by one of the parties. The logical time to announce Räikkönen’s Ferrari-contract would be in Monza. However the ”Iceman” has often proved that the most logical option isnt always the right one. Maybe it’s not this time either? – Räikkönen’s previous Ferrari-contract was announced in Monza, but now the contract won’t necessarily be published there. I was told that the reason for this are contractual matters, of which I don’t yet know more, our source tells us. – But the contract is already signed. It has nothing to do with that. Oh man. No more RBR !!!! Hope Lotus is competitive in 2014. No Ferrari please. If Kimi wants to stay in F1 and in a competitive then I would have thought Lotus was his only option, as he won’t be joining Ferrari or Red Bull. He should stay where he is. 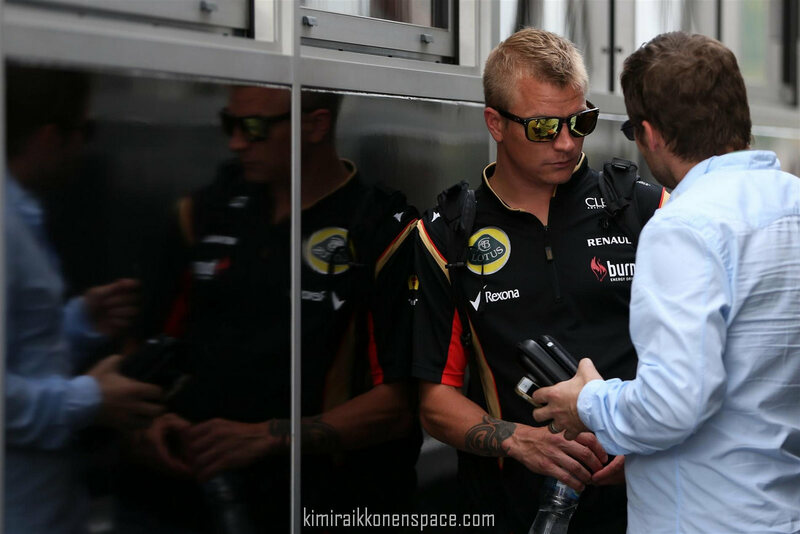 I hope, Kimi will stay in Lotus! I hope, Lotus knows, what THEY have to do to keep him, the fantastic driver and the fantastic person! Even though I and many other fans have bad feelings against Ferrari since the time they did what they did to Kimi, I’m really not sure Kimi himself cares much. He’s said it was in the past. And with resources that Ferrari has, and with Allison being there now as well, I’d say Ferrari would be a good bet if you want to get into a good car. However, I really can’t imagine or see how such a deal could happen.. Agreed to what JB said. In a way. But Alonso and Kimi. Damn, 2nd fiddle to Alonso… that is not what Kimi’s fan had in mind. I also hope he stays with Lotus for now. But the worst thing is, even local news in my country (Malaysia btw) are reporting that Kimi is 80% done deal to jump to Ferrari. I’m just sad. Don’t know why. Hope it’s a blessing in disguise. The switch to new engines in 2014 could benefit Lotus, which could be the reason Kimi will stay there. I don’t believe Ferrari is an option for him – considering his animosity toward Di Montezemolo and the team in general – but stranger things have happened in F1. This is not called the ‘silly season’ for nothing! We will have to wait and see what comes of it all within a few weeks.